NEW YORK (CNNMoney.com) -- Good news for Zhu Zhu fans: The fuzzy electronic hamsters have quickly multiplied from just four last year to more than 40 new ones -- including the Kung Zu battling hamsters -- that will hit stores this summer. The $10 Zhu Zhu Pets, which scurry around the floor making squeaks and interact with each other in separately sold habitats, were the hottest-selling toys of 2009. Kung Zu hamsters feature the "Special Forces" and "Ninja Warriors" teams. According to Cepia Inc., the company that launched the toys last year, more than 7 million U.S. households are already owners of Zhu Zhu hamsters such as the hugely popular "Mr. Squiggles" and "Pipsqueak." Bruce Katz, vice president at Cepia, said the company has so far raked in about $70 million from worldwide sales of these toy rodents. But that was last year. The buzz ahead of the upcoming annual Toy Fair in New York is all about what Cepia has in its toy chest for this year. 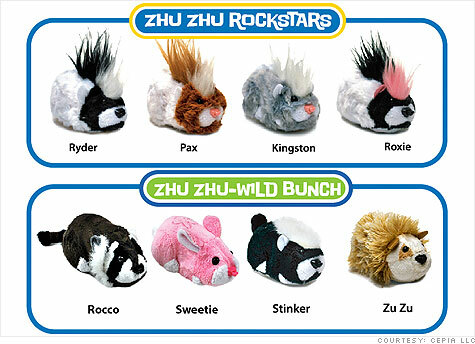 Among the new Zhu Zhus is a line of four hamsters called Rockstars with the names "Pax," "Kingston," "Rider" and "Roxie." The names are inspired by the children of celebrities, including Angelina Jolie and Gwen Stefani. "Rockstars are the first long-haired hamsters with attitude," said Katz. Although the hamsters don't interact with each other, Katz said a smart chip in each toy gives it its own unique personality. Katz said the new "Wild Bunch" collection extends the brand beyond hamsters. "There's a skunk, hedgehog, raccoon and a bunny," he said. There's also a much-anticipated Kung Zhu line of battling hamsters geared primarily for boys aged 8 to 12. Katz said the Kung Zhu line will have eight initial characters split into two battling groups called "Special Forces" and "Ninja Warriors." "We're using a smart chip technology to create good and evil action figures that come to life," said Katz. "As you put them through training, these characters will transform their personality," he said. Katz said the Kung Zhu hamsters start off as "cute" and "mild-mannered." Then they become "fighting, battling warriors." "You can actually hear that transformation take place," Katz said. 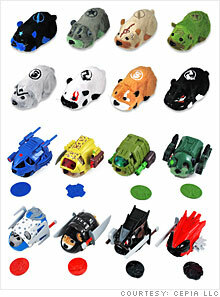 Kung Zhu hamsters feature snap-on armor, weapons, vehicles and a "battledome." "It's all the things that boys really love," said Katz. "But the coolest thing is that you don't know who the winner or the loser is going to be." Cepia will introduce 40 new Zhu Zhu characters in total this year, launching a new line every six weeks, said Katz. And if that isn't enough Zhu Zhu for you, Katz said Cepia is introducing new "play environments" that include cars, boats, an elevator and a beauty salon for these toy hamsters. "The car, boat and other toys are all hamster powered," said Katz, explaining that the running wheels on each Zhu Zhu toy powers the car, boat and elevator into action. But given that kids can easily become bored with one type of toy, isn't Cepia worried about a Zhu Zhu overkill? "We think that with what we shipped last year, we're not even close to fulfilling demand in the marketplace," said Katz. "Kids love to collect, and there's a strong collectible aspect to Zhu Zhu."